The Lonely Planet describes El Salvador as ‘a country of beautiful beaches, dramatic scenery, and friendly people.’While this is no doubt true, El Salvador is also marred with poverty and suffering. Child labor is prevalent, as many young children need to go to work in order to survive, and often provide for their families. Ever wondered where the tasty sugar of your can of Coca Cola comes from? Odds are it is from an El Salvadorian sugarcane mill, which openly uses child labor. Children as young as eight work for up to eight hours a day in hot sun, cutting sugar cane with huge machetes. It is dangerous work, and injuries, sometimes life threatening, are all too common. Other children labor in sweatshops making garments for western countries, children climb landfills in order to collect recycling to sell, and young girls risk physical and sexual abuse by working in the domestic sector. Perhaps the most visible of child labor in El Salvador, is children working in the marketplace. The kids can be seen selling goods and services in the streets, and in local markets, some as young as four and five. This work often includes running in and out of traffic, backbreaking work carrying goods, and working in the extreme heat. Education is expensive, and many poverty-stricken families cannot afford to send their children to school. Children instead spend hours working, their childhood stripped from them, in order to survive. By volunteering through the Global Volunteer Network, Lauren McElroy of Washington, U.S was able to visit El Salvador to see first hand how these people live, and to work for a program that helps to give the children a break from that environment. ‘One of my friends had gone to El Salvador the year before, and she said what an amazing experience she’d had, and that she was going back again’ says Lauren, reflecting on her 5 weeks spent volunteering. Lauren volunteered with a program called ‘Angeles Descalzos’ which means ‘fallen angels’. The program is for kids who work in the marketplace, many whom are unable to afford to go to school, and provides them with the chance to learn and play. The children come to the program part time, when they are not working, and are able to come to this program free of charge, thanks to the support of volunteers. The program enables the marketplace children to take some time out, and provides an environment where they can be themselves and enjoy their youth, as many of the children that Lauren met had been working as long as they could remember. The Civil War in El Salvador which raged for over a decade, ended in 1992 and left around 70,000 people dead, causing over two billion dollars in damages. This put a huge strain on the already struggling economy, and left thousands of men, women and children alike maimed, injured and emotionally scarred. Although the war officially ended in 1992, it still has a massive impact on the day to day life of El Salvador’s people. Many are still left suffering, coming to terms with war related injuries and illness. Lauren stayed with a host family, and was able to see first hand the impact of the war on everyday families in El Salvador. Staying with a host family also provides them with a valuable extra income. Lauren’s host family could then afford to send two of their children to school. One has also recently been able to attend University, thanks to the extra income provided by hosting volunteers. Volunteering in El Salvador also brought Lauren the obvious challenges, such as the language barriers, but these were quickly overcome. Other challenges were not so obvious. Learning about kids lives which are so different from our own childhoods can be heartbreaking. The program, which receives very little government funding, relies on volunteers, mainly from foreign countries, to teach the classes and maintain the program. 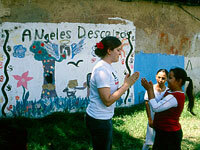 If it wasn’t for volunteers like Lauren, programs like ‘Angeles Descalzos’ would not be able to stay running. By volunteering, Lauren was able to really develop friendships with these children, which is a totally unique element of traveling in a third world country. 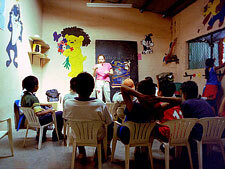 GVN has several programs in El Salvador, including teaching English to children from the marketplace, or children who collect rubbish at landfills for recycling. There are also community maintenance programs, and the opportunity to work in an orphanage desperate for help. 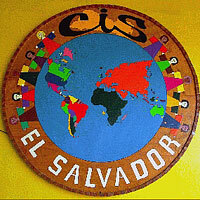 If you are interested in volunteering in El Salvador, visit www.volunteer.org.nz.